Kotegaeshi is an Aikido technique which involves the application of an outward wrist turn. It can be used to respond to a variety of traditional aikido attacks, including a same side wrist grab (katatedori kotegaeshi) . Aikido Warrior Dojo is a Fudoshin dojo operating under the guidance and mentorship of Chicko Xerri Sensei, 6th Dan AKI (Aikikai). In the below video Chicko Sensei uses a dynamic application of katatedori kotegaeshi to illustrate, amongst other things, the balance taking principles that typically underpin Aikido practice. In the below video, Morihiro Saito Sensei (9th Dan) demonstrates and explains the basic form of katatedori kotegaeshi as practised by O’sensei in the immediate post-war period of his life. See below a photo demonstration (including description) by Saito Sensei of the key elements that make up the basic form of katatedori kotegaeshi. Congratulations to Chelsea on her 3rd Kyu grading! Congratulations to Chelsea from our dojo on her excellent 3rd kyu grading in Aikido Yuishinkai on Saturday. As anyone who has done a grading knows, it’s the preparation and training preceding it that is typically the toughest part. With that in mind, the below video of the event also features some of the training that Chelsea undertook in preparation. Big thanks to everyone who participated in the grading and helped Chelsea prepare for it. In the below video, Dojo senior Jeremy Gehrke demonstrates the Aikido technique – Munetsuki hiji kime. The technique is applied in the context of a traditional knife attack to the abdomen. In the below video clip, Mike Jones Sensei from NY Aiki kai demonstrates an alternate version of tanto tori munetsuki hiji kime. In this version the nage remains standing at the completion of the technique (similar to a traditional kokyu nage ending ). The principles being applied, however, are the same and equally applicable to the featured video demonstration (above). Also included in the video are combined elbow and choke retraining techniques for addressing an attack with a tanto. These techniques are also practised at our dojo. Nikyo techniques involve the application of a painful pronating or adductive wristlock to subdue or pin an attacker. They are a common feature in the syllabus of most Aikido schools. Nikyo techniques can be used to address a wide variety of attacks. They are particularly effective in circumstances where the uke attempts to grab the clothing or wrist of a nage (as a prelude to follow up strike). Our dojo is a Fudoshin dojo operating under the guidance and mentorship of Chicko Xerri Sensei 6th Dan AKI (Aikikai). In the below video Chicko Sensei explains the sword movements and Aiki principles which underpin the application of Ai hanmi katatedori nikyo. 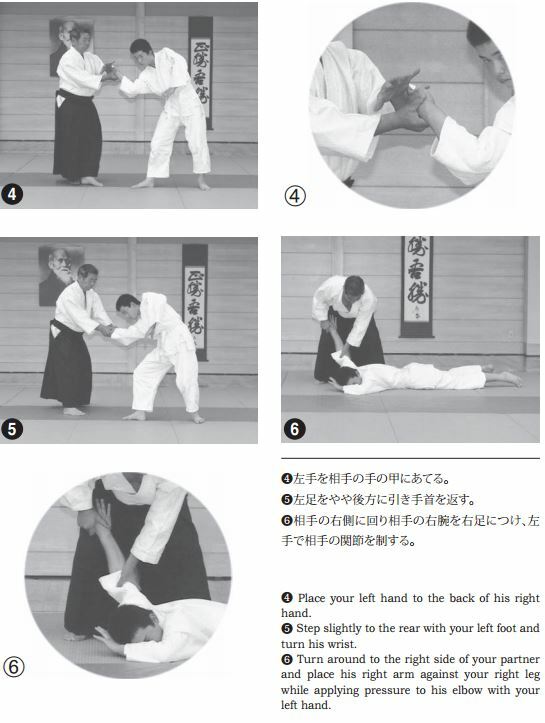 This form of nikyo is applied in response to an attack in the form of a cross hand grab. Depending on the school, Ai hanmi katatedori nikyo is also referred to as Kosadori nikyo. See below a photo demonstration (including description) and video of Morihiro Saito Sensei (9th Dan) explaining the fundamental elements of Kosadori nikyo as practised by O’sensei in the immediate post war period of his training life. In the below video Sensei Andy Hathaway demonstrates and provides instruction on Kosadori nikyo as practised at the London Aikido Club. In the below video Sensei Andy Hathaway of the London Aikido Club demonstrates and provides instruction on an alternate takedown for Kosadori nikyo. 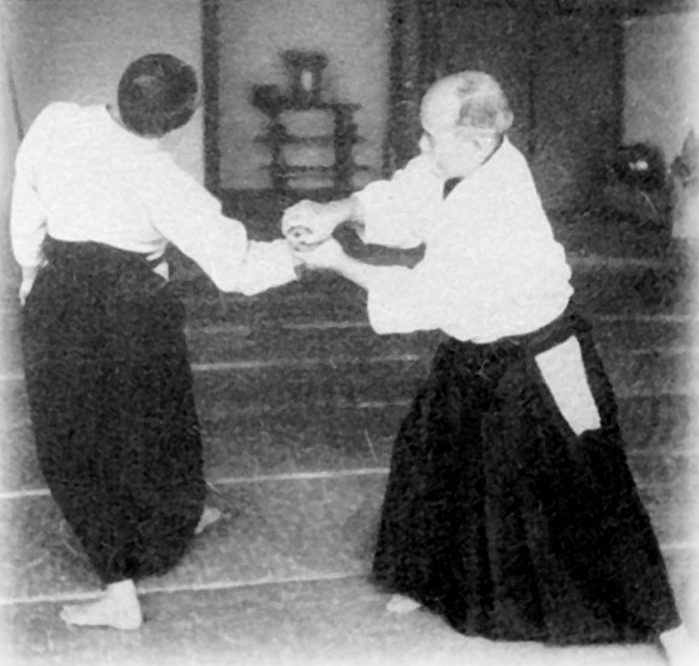 Saito Sensei spent his teaching life dedicated to preserving the technical style of Aikido as practised and shown to him by O’sensei in the post-war period. Without his commitment to preserving the Aikido of the Founder and extensive efforts to record and document his teachings, much of the Aikido of O’sensei may have been lost.